All bookings with Alpine Sherpa are subject to these conditions. Contracts will be governed by, construed and interpreted in accordance with, English law. Alpine Sherpa is a trading name of The Tignes Chalet Company Ltd.
and acknowledged the terms and conditions check box on the Transfer Guest Details Form. If the booking has been made through a tour operator, whereby the client pays the tour operator directly, then their deposit payment to the tour operator acknowledges the terms and conditions. The Party Leader is the person who reads and accepts the terms and conditions. This person enters into this contract on behalf and with the consent of all persons named on the booking form. The party leader accepts responsibility for all persons included in the booking in relation to payment and these terms and conditions. The Party Leader must be at least 18 years old. All bookings require a 50% deposit. The remaining balance is due no later than 8 weeks before departure. If full payment is not received 8 weeks before the departure date Alpine Sherpa reserve the right to cancel the booking and retain the deposit. Payment can be made by debit or credit card. All card payments (both credit and debit) will incur a handling charge of 2%, per transaction. • 4-8 weeks before the departure date 75%. • Less than 4 weeks before the departure date 100%. In the unlikely event of cancellation by Alpine Sherpa you will receive a full refund. Alpine Sherpa requires you to have travel insurance including winter sports cover when booking a holiday. Alpine Sherpa advise passengers to check that their own travel insurance covers damage and/or losses to luggage. Every effort will be made to amend a booking, however the party leader will be liable for any increased costs resulting from changing the booking, plus an additional £25 administration fee. Current passports are required for travel outside of the UK. If you do not hold a British or EEC passport you may require a visa for travelling to France or Switzerland (if you fly to Geneva). In this case Alpine Sherpa recommends you check with your consulate. Alpine Sherpa reserves the right (and delegates to its employees the right) to refuse to carry any person who is thought to be under the influence of alcohol or drugs and/or whose behavior is considered to pose a threat to the driver, the vehicle or the other passenger(s). If the person(s) is already in a vehicle then they will be asked to leave immediately. Passengers are not allowed to consume alcoholic drinks during any journey. Smoking is not permitted in Alpine Sherpa vehicles. Passengers who soil the interior of a vehicle may be liable to pay a cleaning charge. All of the Alpine Sherpa vehicles are fully insured for passenger and third party claims. Your property however is carried at your own risk and no responsibility can be accepted for loss or damage. Passengers are limited to two items of luggage (one usual holiday luggage bag and small hand luggage bag), and a ski or snowboard bag (per person). Any luggage in excess of the above should be declared at the time of booking. Alpine Sherpa reserves the right to charge an excess baggage allowance, or refuse to transport the items if entirely necessary. The Alpine Sherpa will not be liable for problems or delays caused by strikes, political unrest, riots, hostilities, terrorist activity, war, industrial disputes, compliance with requests of the police, fire, flood, tornadoes, hurricanes, transportation problems, airport closures, weather conditions or any other event beyond our immediate control. Your travel insurance should cover this. Alpine Sherpa cannot accept liability or pay any compensation where the performance or prompt performance of our contractual obligations is prevented or affected by “force majeure”. In these booking conditions, “force majeure” means any event, which Alpine Sherpa or the supplier of the service(s) in question could not even with all due care, foresee or avoid. These events are ones such as listed above. If incoming flights are delayed for more than 60 minutes, Alpine Sherpa will make every effort possible to hold the waiting minibuses, but there is no guarantee. In these exceptional circumstances where flights are excessively delayed, Alpine Sherpa may make an additional charge of 25 euros per hour for a transfer. 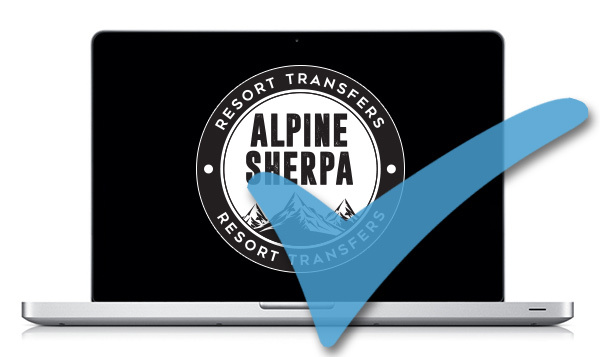 Alpine Sherpa reserves the right to cancel any transfer. The client is responsible to provide correct travel information to Alpine Sherpa using the Transfer Details Form. Alpine Sherpa cannot be held responsible for resulting missed flights/any connecting travel due to misinformation. Alpine Sherpa can work as agent and sub-contract transfers should they need to do so, for example mechanical failure of a minibus. When and where possible, Alpine Sherpa will contact the client to notify of this arrangement. If an operator (Taxi Company or other minibus transfer company) is used, then the client will be bound by the Terms and Conditions of this operator. For Alpine Sherpa the liability regarding the carriage of passengers is only confined to its own services/vehicles. We must ensure that all vehicles and services meet the standard advertised on the website. Catered chalets and self catering apartments in Tignes France.